A thriller set in the nocturnal underbelly of contemporary Los Angeles. Lou Bloom is a driven young man desperate for work who discovers the high-speed world of L.A. crime journalism. Finding a group of freelance camera crews who film crashes, fires, murder and other mayhem, Lou muscles into the cut-throat, dangerous realm of nightcrawling – where each police siren wail equals a possible windfall and victims are converted into dollars and cents. Aided by Nina, a veteran of the blood-sport that is local TV news, Lou blurs the line between observer and participant to become the star of his own story. What a brilliant performance of Jake Gyllenhaal in this rather morbid and exciting thriller. At times I was wondering whether it was meant to be amusing and jokingly or that it was intended to be presented as a serious and shocking story. Judging from my own chuckling at times and disbelief about what was being shown, I could only conclude that ultimately it was a mix of both. And it’s masterly portrayed by Gyllenhaal, the chameleon of Hollywood and someone I do appreciate very much as an actor. After his appearance in “Prisoners” (which was an exceptionally exciting film) and the arty movie “Enemy” (as a story it was not my cup of tea, but in terms of performances it was again a success) just like Matthew McConaughey in “Dallas Buyers Club” he transformed physically into a gaunt, pale-looking good-for-nothing. Initially, he looks like a marginal person with a mental disability, but as you get to know him better, you come to the conclusion that he’s extremely intellectual and has a kind of photographic memory. The way he quotes chunks of information that he has read on the Internet is pretty impressive. Louis Bloom is not exactly a simple figure but rather a cunning and manipulative character. The whole story starts with Lou in the proces of cutting a fence. He’s initially no more than an insignificant criminal who earns his money by stealing copper and the like. Until he witnesses an accident one night on one of the highways around Los Angeles and he sees a freelance reporter (Bill Paxton) capturing the whole thing on film and afterwards selling it to the highest possible price so that it can be used for the morning news. Lou doesn’t waste any time and purchases a simple camcorder and police scanner. Immediately an assistant (Riz Ahmed) is being contracted and he hits the streets every night to film police interventions. His unconstrained personality and unscrupulous approach, ensure that he can capture pretty sensational images, allowing him to conquer a permanent position at the local station KWLA6. Here it’s Nina Romina (Rene Russo) who rules as news editor. The straightforward film style of Lou appeals to her. As a sensation channel the presented footages can’t be bloody enough. As she clearly stated : “The best and clearest way that I can phrase it for you, to capture the spirit of what we air, is think of our news cast as a screaming woman running down the street with her throat cut”. 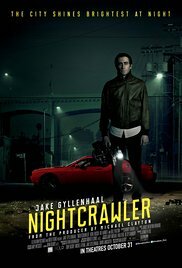 As the title “Nightcrawler” partially reveals it, most of the scenes are made during the night in the city of Los Angeles. This provides some beautiful nighttime shots with Lou speeding around in his shabby car (which subsequently will be replaced by a flashy sports car) through the streets on his way to a variety of calamities he has overheard by using the scanner. He’s a “disaster tourist” equipped with a camera. The film is an indictment against the growing sensationalism in contemporary reporting. The look and shocking effect takes precedence over content and objectivity. You can compare it with the bread and circuses in the Roman Empire. Lou is the personification of this somewhat repulsive attitude. On the one hand he’s quite insane and frightening. On the other hand he’s a real goal getter who misuses the Achilles heel of the media world in a shrewd way to benefit from. One man’s loss in this case is Lou’s gain. That the masterful rendition by Gyllenhaal, as the extremely manipulative and creepy Lou, takes on the lion’s share of this exciting and simultaneously satirical film, is beyond dispute. But the supporting characters contributions are as important,convincing and certainly successful. First there is Riz Ahmed as the pitiful Rick, the assistant Lou has chosen in between, after a rather absurd interview. Rick is the prime example of someone who can use the money and who’s offered the job because he has a smart phone with GPS function. He’s overwhelmed by the silver-tongued Lou and him being a dogsbody afterwards was also predictable. No wonder you instantly think he’s likeable. It was also a pleasant surprise to see Rene Russo acting again as Nina Romina, the unyielding editor without a conscience. I haven’t seen her after “Lethal Weapon 3“. The fact Dan Gilroy is her husband, probably made sure that the selection criteria were flexible. Yet this wasn’t a bad interpretation and you witnessed the way Lou gradually took control over this seemingly fragile little personality. It was clear how it would end eventually. Although there was a choice between two possible denouements (two logical endings that arose to me spontaneously), the end was still intense and surprising. A disgusting example of self-centeredness and self-preservation. An example of which way our society is going and how people disregard ethics. The moral of the story is that there’s a lack of morality in the media landscape and society today. Does this sound pretty cynical, nasty or downright morbid to you ? I’d suggest to take a look at yourself in an honest way and think whether or not you would slow down when passing a traffic accident in order to catch a glimpse of a victim? Or you’d return home quickly to zap to a news channel just because you have heard a disaster happened somewhere ? You come to the conclusion afterwards that we are all a little bit like Lou. Disturbing ? Yep !